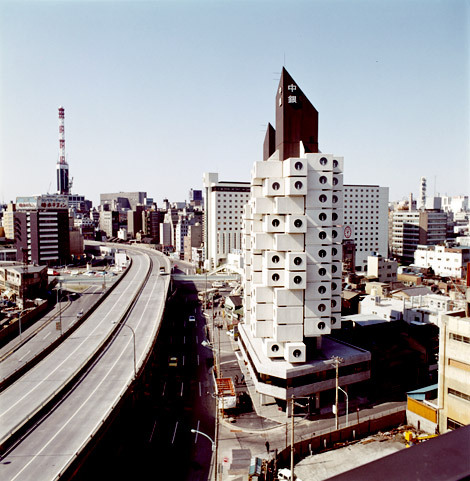 The Nakagin Capsule Tower, not long after its construction. © Kisho Kurokawa Architect & Associates. Photo: Tomio Ohashi. 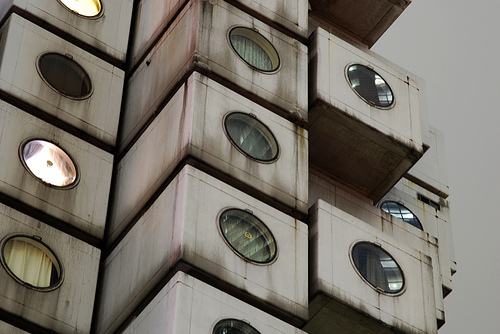 Completed in 1972 the Nakagin Capsule Tower (中銀カプセルタワー Nakagin Kapuseru Tawā) is a mixed-use residential and office tower designed by architect Kisho Kurokawa and located in Shimbashi, Tokyo, Japan. 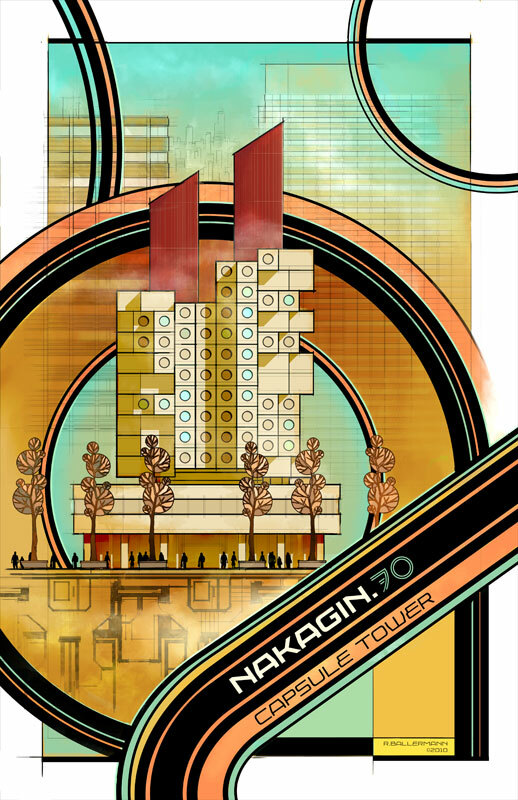 An exercise in Metabolist architecture, tower has also served as a prototype for uniquely Japanese urban accommodations, such as business and capsule hotels. 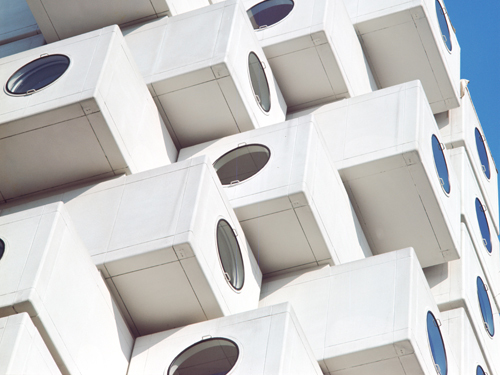 "The building is actually composed of two interconnected concrete towers, respectively eleven and thirteen floors, which house 140 prefabricated modules (or "capsules") which are each self-contained units. 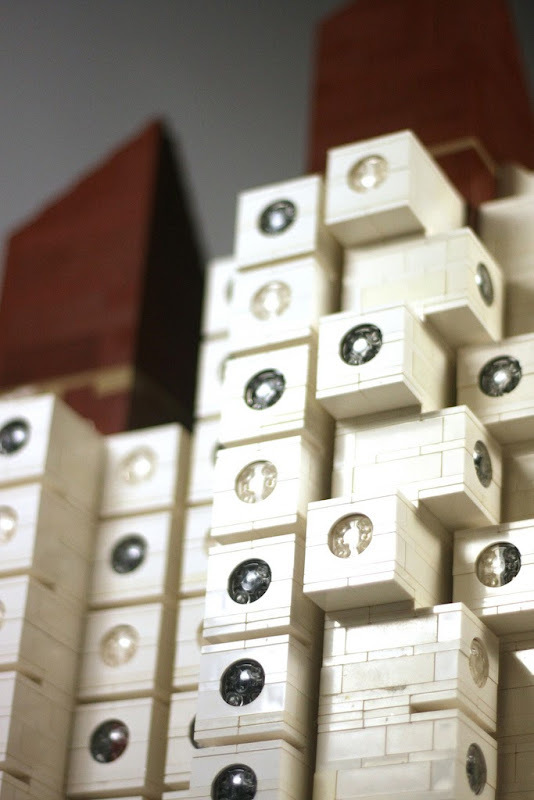 Each capsule measures 2.3 m (8 ft) × 3.8 m (12 ft) × 2.1 m (7 ft) and functions as a small living or office space. 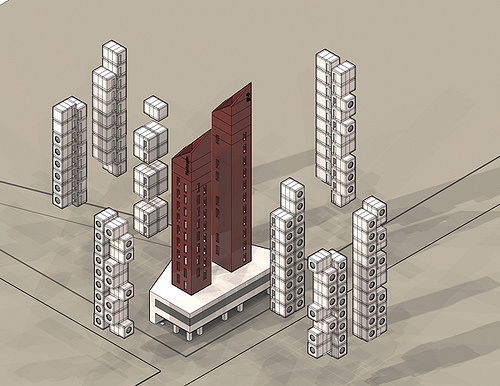 Capsules can be connected and combined to create larger spaces. Each capsule is connected to one of the two main shafts only by four high-tension bolts and is designed to be replaceable. No units have been replaced since the original construction. The original target demographic were bachelor salarymen. 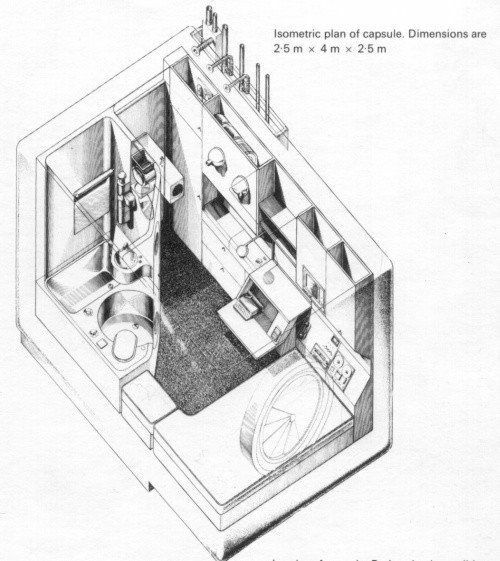 The compact apartments included a wall of appliances and cabinets built in to one side, including a kitchen stove, a refrigerator, a television set, and a reel-to-reel tape deck. A bathroom unit, about the size of an aircraft lavatory, is set into an opposite corner. A large circular window over a bed dominates the far end of the room. Construction occurred on site and off site. On-site work included the two towers and their energy-supply systems and equipment, while the capsule parts were fabricated and the capsules were assembled at a factory. 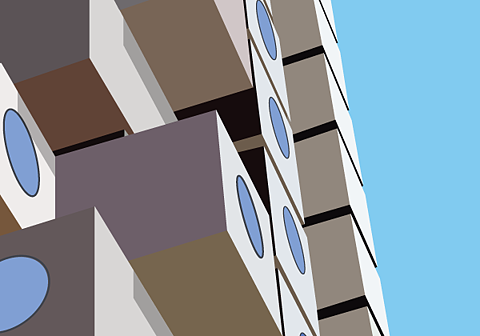 The capsules were fitted with utilities and interior fittings before being shipped to the building site, where they were attached to the concrete towers. Each capsule is attached independently and cantilevered from the shaft, so that any capsule may be removed easily without affecting the others. The capsules are all-welded lightweight steel-truss boxes clad in galvanized, rib-reinforced steel panels. After processing, the panels were coated with rust-preventative paint and finished with a coat of Kenitex glossy spray. The cores are rigid-frame, made of a steel frame and reinforced concrete. From the basement to the second floor, ordinary concrete was used; above those levels, lightweight concrete was used. Shuttering consists of large panels the height of a single storey of the tower. In order to make early use of the staircase, precast concrete was used in the floor plates and the elevator shafts. Because of the pattern in which two days of steel-frame work were followed by two days of precast-concrete work, the staircase was completely operational by the time the framework was finished. On-site construction of the elevators was shortened by incorporating the 3-D frames, the rails, and anchor indicator boxes in the precast concrete elements and by employing prefabricated cages." Sadly it's been knocked down now. Great post - love this building. I am nick, the nick from the site you've linked to at fiorebw.com. Thanks for finding my work, love to share and see interest in Nakagin. BTW - the link is broken (..it ends ".comon" instead of ".com").